We've been waiting for the UK release of Sony's microconsole for quite a while. It was hinted that the PS Vita TV might make its way to regions outside of Japan at the end of last year - and now it's finally here, renamed the PlayStation TV, or PS TV for short. But despite its name, the PS TV isn't as prime a competitor to Amazon's Fire TV and Google's forthcoming Nexus Player for a simple reason: its lack of TV content at launch. There's no Netflix yet, for example, with Sony's own rental and purchase service instead sitting at the fore. Yet we don't really mind, because the PlayStation TV is a microconsole that will suit a specific audience. As a standalone cheap and cheerful gaming device that you can tuck away out of sight, or for Remote Play of your PlayStation 4 titles on a second TV screen around the home, it's a product that proves its worth. But is it too fraught with issues on release day? 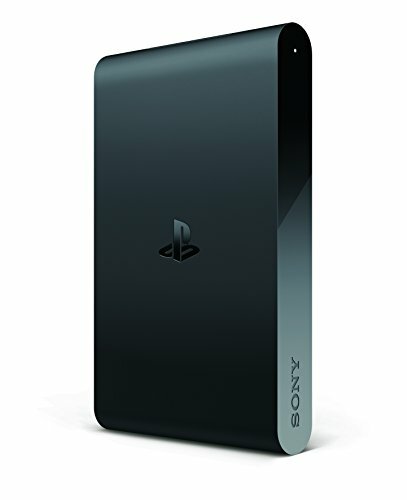 The PS TV is a dinky box, the width of a playing card, and less than half the size of a the Amazon Fire TV set-top box. But that doesn't mean it lacks connectivity, with Wi-Fi connectivity and ports on the back for USB, HDMI, a Vita memory card, power and Ethernet. A flap on the side also hides a slot for a Vita game card, should you already have shop-bought compatible titles. Having shed its original Vita title, the PS TV retains the handheld console's trademark user interface and a chunk of its gaming talents - albeit without the portability. However, without any touch-based controls - you'll need to have a DualShock 4 controller to play (not included) - there's not a 100 per cent compatibility rate with Vita games. With an internet connection it's possible to download games from the PlayStation Store, but the headline feature is for PlayStation 4 owners to use Remote Play. This has been a PS Vita feature since last year and, more recently, Sony Xperia Z2 and Z3 smartphones and tablets have also got in on the act. Remote Play on PS TV and will undoubtedly be the main driver behind purchases as it will enable a PS4 owner to access their console and play games remotely. This works by streaming video from the PS4 of whatever is on the screen, with control codes sent in the opposite direction via the PS TV from a paired DualShock 4 controller. The illusion is that the game is running on the PlayStation TV itself, with little lag nor a massive drop in quality. There are some caveats though. The video is reduced to 720p maximum and at a lower frame rate. Audio is also curbed, to 2.0 stereo from 5.1. The most common use of the box will be in the bedroom hooked-up to a smaller TV screen, so these ought to not be major issues . We tested the feature with DriveClub, Destiny and Battlefield 4 and they all ran smoothly enough to keep up with the action and not hamper our progress. It's not exactly the same as playing on the PS4 directly, but definitely good enough for some bedroom gaming. The Ethernet port is important as the PS TV requires an internet connection and Sony advises that it works best when wired. The Wi-Fi on board uses 2.4GHz Wi-Fi only (not dual band) which might become an issue the further away from your home router you want to use it. It must be said that we've heard from many others that lag has been an issue, even when connected by Ethernet. This may depend on your router - ours is a Virgin Media Super Hub 2 - as in our case the end result was very playable. We didn't have any issues when using just Wi-Fi either. We've had a second PS TV unit installed in the London home of our Reviews Editor just to be sure, as a good home network may be a crucial factor. Review unit two maintained a strong signal over Wi-Fi with smooth video and no dropout issues, but did exhibit controller input lag. Using a powerline adapter - to maintain a strong connection using the existing electrical wiring around the home, something like the Devolo dLAN 500 will do the job - and the Ethernet connection improved the experience. If you are sticking to Wi-Fi only and fall into problems then there is an option in the PS TV's settings where you can reduce the picture quality to less than 720p for smoother play - but we didn't find that necessary in our experience. There's also a good argument for owning a PlayStation TV even if you don't own a PS4. As it's essentially a screen-less Vita, it's capable of playing a wide swathe of PS Vita, PSOne and PSP games downloaded from the PS Store or, for Vita games, inserted through the game card slot to the rear. And if you've already got a PlayStation Network account and have been downloading any titles in those categories, you can play many of them through the microconsole. The main issue we had is that only a select number of games are compatible at present - specifically in the PS Vita line-up. We can understand that without a touchscreen some games can't function correctly, but there are plenty available for the handheld that aren't restricted, we feel, yet still not able to play via the PS TV box. One of those is Assassin's Creed Liberation, which just throws up a compatibility message when inserted into the card slot. WipeOut 2048 too is unable to play. We did get all the more recent indie games we downloaded to work, so perhaps that's being addressed at present, starting with those that came out in the last few months initially. If that is the case, you would be advised to sign up for a PlayStation Plus account, as you'll get games to play each and every month as part of your subscription. And if you own a PS4 and/or PS3 too, that's a complete no-brainer as you'll get full games to download for all your consoles. On launch day the PS TV isn't exactly filled with TV content like the name may suggest. No Netflix. No iPlayer. Not much of anything really. Even using it to stream media from other sources is limited (MP4 works, but that's about it and even then the playback is poor). Sure, you can rent and buy movies and shows via PlayStation Store using Sony's service, which will have some appeal, but it's not a full-on set-top box experience by any means. However, Sony has told us that it is in talks with one or two video streaming services (YouTube?) to offer access. We suspect the feature set will grow in coming months, so if it's applications and content that you want from this little box then it's best to wait for the time being. At some point in 2015, the PS TV will also get access to PlayStation Now when it launches in the UK. That will present PS3 games to rent and play through Sony's cloud gaming platform. It works a bit like Remote Play but the games are stored on massive servers elsewhere in the world and you will pay to play. Hopefully a monthly subscription model will have been adopted by then - the service is out in the States already, but only as a rental option - and we can see a "Netflix of gaming" working well with the small PS TV device. Some might say that PlayStation Now couldn't come quickly enough, but we can see enough merit in the PS TV to warrant a purchase this year. Despite TV content lacking and not all services being up-and-running for UK buyers, the PlayStation TV's focus on gaming is what will make it appeal. That's what this little box is all about. If you own a PS4 then PS TV adds an all-new element to your set-up, one that enables you to carry on playing your favourite games via Remote Play, even after being kicked off the living room television in favour of Strictly Come Dancing. In addition, with the ability to play plenty of games on the PS Store already, most of which are at cut-down prices, you can game at a discount. It is annoying that the compatible game list is curtailed, but there are still plenty of options available. It's probably most irritating to those who already have a healthy library of Vita games that they can't play across platforms, but those who don't won't even notice. PlayStation TV is all about its Remote Play and gaming abilities. For the right audience, and for those with a decent home network, it's a product with promise. We can't wait to grab ourselves a stack of PS One games and relive our youth. And that seems well worth the £85 cover price.